Tech companies, and increasingly even non-tech companies, are struggling with the fact that there are not enough trained data scientists to fill market demand. Every company has their own strategy for hiring and training, but Airbnb has taken things a step further — running its own university-style program, complete with a custom course-numbering system. Data University is Airbnb’s attempt to make its entire workforce more data literate. Traditional online programs like Coursera and Udacity just weren’t getting the job done because they were not tailored to Airbnb’s internal data and tools. So the company decided to design a bunch of courses of its own around three levels of instruction for different employee needs. 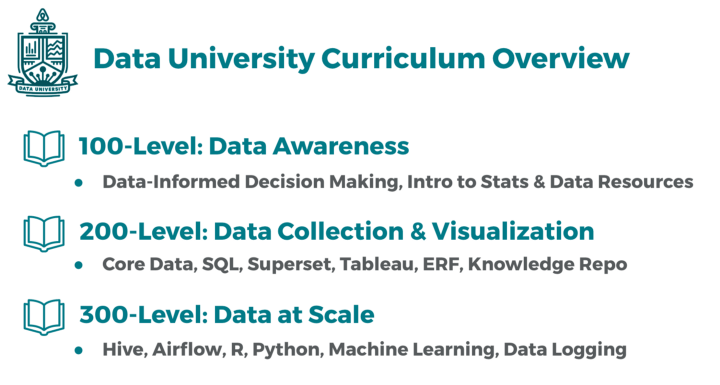 100-level classes on data-informed decision making have been designed to be applicable to all teams, including human resources and business development. Middle-tier classes on SQL and Superset have enabled some non-technical employees to take on roles as project managers, and more intensive courses on Python and machine learning have helped engineers brush up on necessary skills for projects. Since launching the program in Q3 2016, Airbnb has seen the weekly active users of its internal data science tools rise from 30 to 45 percent. A total of 500 Airbnb employees have taken at least one class — and Airbnb has yet to expand the program to all 22 of its offices. Feng hopes that other companies will adopt similar practices when designing their own internal data science courses. The program seems to take a page from Google’s internal classes that helped it differentiate back in the day. Google’s version includes both technical and non-technical courses, ranging from data visualization to beekeeping. Airbnb rolled out its intro data science classes first, making a statement that the program was about more than just engineers, though the more technically inclined will be getting additional higher-level classes moving forward.